ON THE WHARF: People gathered on the Central Wharf's tiers of balconies overlooking the Buffalo Harbor, circa 1870. 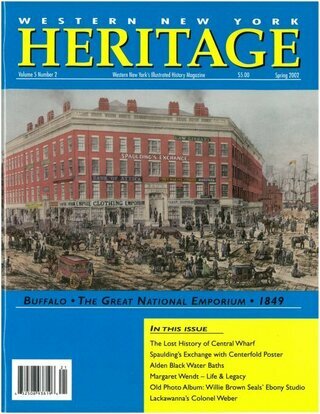 Few people today are aware of the significance of Buffalo’s Central Wharf, although its history is one of national importance. It was a picturesque and vibrant commercial center and one of the greatest intermodal transportation centers of 19th century America. It developed as a direct result of the connection of the Erie Canal terminus and Great Lakes shipping. Its history spanned a little over half a century, roughly from the opening of the Erie Canal to the railroad’s eclipse of the canal, paralleling the great movement westward of emigrants populating the mid-continent. According to historian Frank Severance, the Old Central Wharf was a major landmark and even the toughest businessmen became sentimental at its passing in 1883. “The old wharf had so long been the business home of many of these men that its destruction seemed to them little less than desecration. 1872 MAP: Showing building lots and owners of the 1,000-foot-long Central Wharf between the foot of Main Street and the Commercial Slip. The Wharf occupied the entire area along the north side of the Buffalo River from the foot of Main Street west to the Commercial Slip. Current aerial. Image from Google Maps. Topographically it is the base of the large triangle formed by the convergence of Main Street and Commercial Street at the Terrace (with Spaulding’s Exchange at the apex of the triangle). A thousand feet of nearly continuous building frontage lined a 40-foot-wide wooden plank dock between the water and Prime Street, the street that paralleled the river behind the line of buildings. Central Wharf referred to the entire architectural complex of buildings and wharf. Most of the individual buildings were built of brick, four stories high, and (although they presented a variety of roof lines and window arrangements) they all maintained a uniform front wall line along the wooden dock. BUFFALO WATERFRONT 1853: The J.W. Hill drawing engraved by J.H. Colen shows the Central Wharf buildings to the left of the foot of Main Street. Wharves extended along the north shore of the Buffalo River from the Evans Ship Canal to Michigan Street. Central Wharf was in the center of the wharves. There were no residences there. No one lived on the Central Wharf. Nor was there much retail trade. The Central Wharf was a wholesale trade mart for forwarders and commission merchants. The buildings contained warehouses, sail-lofts and offices. To transport freight cargoes that had been stacked up on the dock, horse teams had to be backed through the first story warehouses to access this all along the wharf. The buildings were designed to accommodate that pass-through function. There were also a number of public covered passageways through the buildings to provide pedestrian access to the waterside; otherwise pedestrians had to enter from the foot of Main Street. DIRECTORY ADVERTISEMENTS 1857 & 1880: The Central Wharf was all business. It was distinct from the notorious canal district. There were no boarding houses, dance halls or saloons on the Central Wharf. There was a great deal of foot traffic on the Central Wharf, people coming and going and conducting business on the dock. In the 1860s it was said to be “as travelled as any portion of Main Street downtown.” Daily during the navigation season, there were continuous streams of people moving in both directions on the heavy plank dock. The foot traffic expanded and continued at the second story level where a 15-foot-wide connected wooden gallery ran continuously along the building fronts. There was a set of stairs every 50 feet or so along the length of the balcony. The balcony itself became a busy thoroughfare communicating between hundreds of offices. A drama created not from the imagination but from concrete excavation, paintings and drawings of the time, legal documents and site observation. What it was like to stand on the Buffalo waterfront before the railroads, when the only highway was on the water. Steam yachts provided Buffalo’s wealthy with a fashionable means of racing, cruising—or even commuting to work! Here we take a look at a number of these luxury craft and the men who owned them. Franklinville's Norman Maffei had such an expansive catalog of artwork that we couldn't run them all in the Winter 2016 issue.